EuroCAD Creative is the complete CAD solution for apparel industry, providing fast and accurate support for the entire preparation of a new garment, from simple design to production optimisation. EuroCAD Creative is delivered as a package containing the PC station and the three major software applications: EuroCAD Pattern Designer, EuroCAD Spread&Cut Planner and EuroCAD Automarker. Please check the technical data sheet of each individual application to find more EuroCAD Creative working station can be used as a stand-alone design station or integrated in a local network, offering a large flexibilty to perfectly fit any user requirements. For input and output, EuroCAD Creative can work with a wide range of plotters and digitizers and can import directly files from Gerber, Lectra and Assyst native format and also from DXF-AAMA files. Don't waste time placing the patterns on a special digitizing surface, fixing them with adhesive tape or other time-wasting methods. Just clean-up a bit your normal working table, leave the patterns there and go to computer. ONE simple click, and the camera automatically captures the picture and transfers it to the computer. The image is automatically processed and the patterns are extracted in just few seconds. A smart and simple calibration procedure is necessary only one time when you first install the system, offering a comfortable precision of less than 0.7 mm. Quick and easy inspect the result of the automatic digitizer using the Contour Play function. Measure distances and perimetral contour, check and adjust the internal elements or the shape of the curves if necessary, add or delete any element, input the piece name, all in one single window. Done! Easy to use zoom and navigate functions and the special magnifier viewer make your activity easy and efficient. Save the patterns directly in the native format of your CAD system. The photo digitizer can save the patterns in the native original format of Lectra, Gerber, Investronica, Assyst, Gemini. The patterns can also be exported for any other application using the standard dxf aama format, and it was tested with FK, TetraCad, Optitex, Wearcad, Konsan, Tukatech, PolyPattern, Richpeace, Novocut, Vetigraph, Consult+, Astor, AGMS, Julivi, Moda 01 and others. When you design your own products or collections, EuroCAD Pattern Designer is the software environment in which the designer's ideas are easily transposed in perfectly built and checked pattern projects. 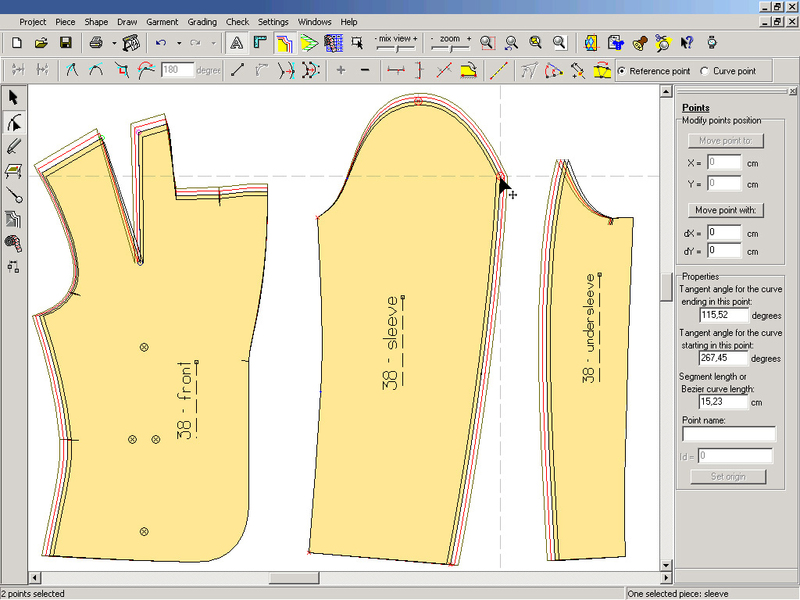 Gifted with unique design functions like reversible folds and darts, automatic & interactive seam allowance creation, automatic notch translation and the all-sizes dimension watcher, EuroCAD systems allows a quick and perfect pattern design. Automatic grading and the interactive grading functions allows the previous experience to be stored in grading rules and easily applied to the new products. EuroCAD Pattern Designer is based on Bezier curves, but can also handle complex polyline or B-Spline Curves. The EPD's interface has a very different approach compared to other CAD applications, because is built to be extremely user friendly, according to the latest software standards. The average time for a new user to learn the application is less than a week. If you are usually using paper pattern from you partners the first step is to digitize those patterns. By digitization, the geometrical shapes of the pattern are transmitted with high precision to the computer in order to be stored in digital format. The pattern is positioned on the digitizing table and the operator follows the contour using the pointing device, also marking notches, darts, grain line and other technical elements. This operation may take up to 5-10 minutes, according to the operator skills. 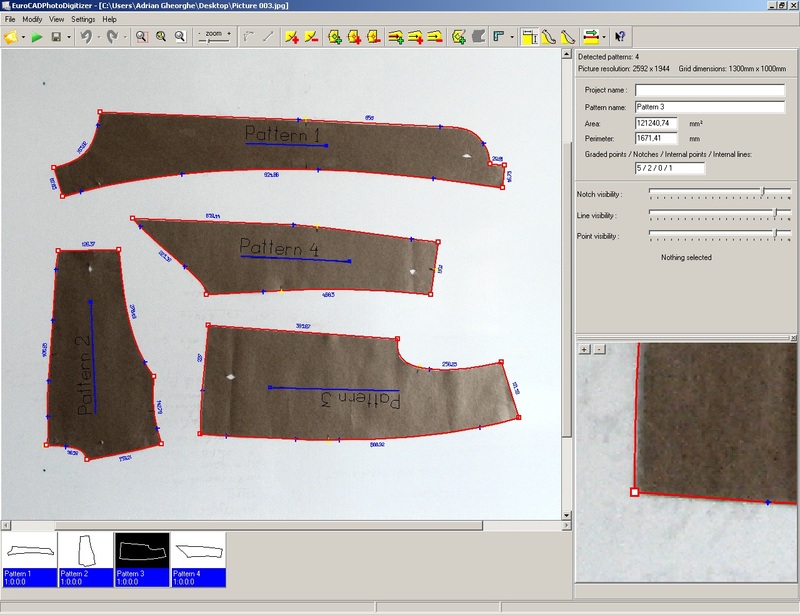 The digitizing step can be skipped if the client sends you the patterns as computer files, directly imported by EuroCAD Pattern Designer. EuroCAD is fully compatible with all major CAD systems and recognizes the most used type of CAD files. EuroCAD has built-in direct convertors from Lectra, Gerber and Assyst. It is also capable to import and export in standard international format like AAMA DXF or HPGL. After the patterns were digitized, the operator introduces in the computer the grading rules for each piece, using the dimensions from the product's specification sheet, sent by the client. However, automatically grading methods may be used, based on the grading rules previously stored on your computer. Grading is done easily and with high accuracy. EuroCAD has one of the fastest and most accurate grading methods. The graded sizes can be simultaneously displayed on the computer screen and can be aligned in order to be checked in various ways. According to the product complexity, grading may take 10 to 20 minutes. 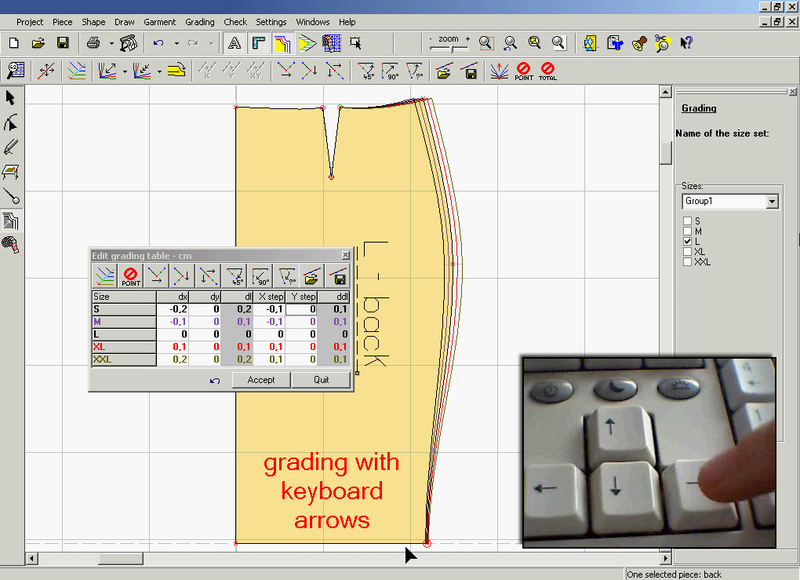 When using the EuroCAD Tailoring Assistant module, the grading can be done in seconds completely automatic. The automatic grading method is based on complete redrawing of each pattern, respecting the standard construction rules and formula. This method will always ensure perfect fitting for all sizes without any deviation. All patterns can be automatically checked for problems concerning the seam line length, the matching of notches and the geometrical shapes correspondence. Patterns can be displayed and checked folded or unfolded, with or without seam allowance, with the darts closed or opened. All measurements are stored by the program in a special table called watcher. This watcher is a unique tool, very useful because it allows the user to supervise the changes on all the sizes of a piece as they happen, while modifications or grading are done. Checking a medium complexity product takes about 5 to 10 minutes. All measurements are automatically calculated and displayed on the base size as well on graded sizes. This table also accepts formula to calculate combined dimensions, using simple mathematical operations. 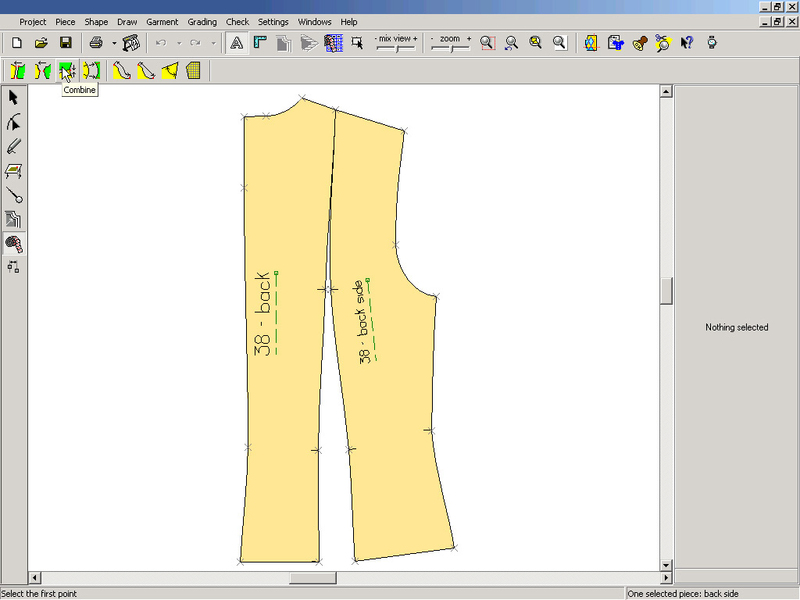 In the EuroCAD Spread&Cut Planner (ESCP) application, the operator sets the quantity of garments ordered by the client for each model, size and fabric, and some general settings regarding cutting: the length of the spreading table, the maximum number of sheets in the lay and the fabric width. 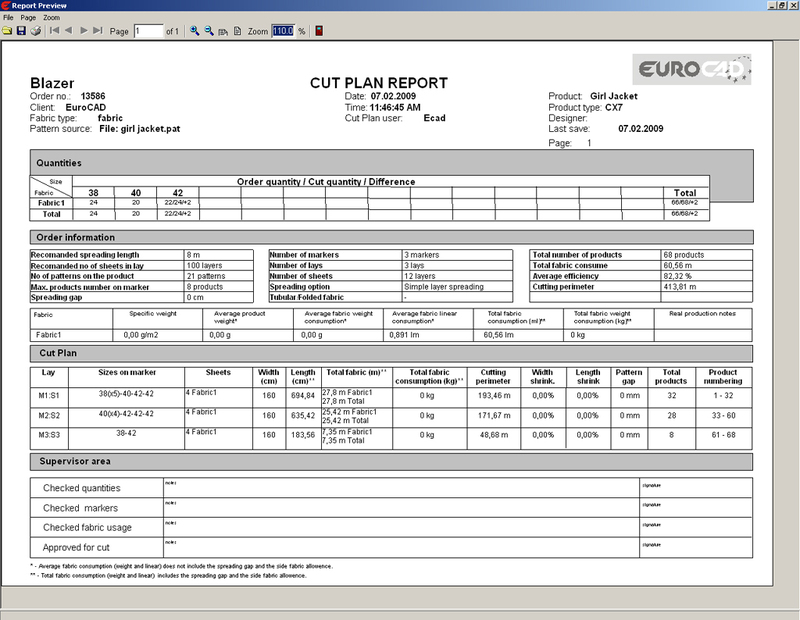 The EuroCAD Spread&Cut Planner application can automatically generate the most efficient plan for size grouping and distribution on markers, so a minimal number of markers and lays are needed to obtain the ordered quantities. This automatic operation takes only few seconds to complete. The user may choose among several automatic strategies of lay planning, as well as manual or semiautomatic methods, so the best results are obtained every time. EuroCAD stepped over border where the automatic nesting is better than the manual nesting, both on speed and efficiency. EuroCAD Automarker is based on state of the art technology and algorithms that will provide excellent nesting results in record time. It can run full automatic nesting for one individual marker or work continuously for a list of markers, with no human intervention required. The usual time needed for an average marker of 8 m is about 3-5 minutes. The average results in terms of speed and efficiency are considerably higher than manual nesting. EuroCAD Automarker can perform full automatic nesting on simple, folded or tubular fabrics, with or without plaids, stripes or textures, with specific widths and contractions, according to each piece specifications and restrictions. EuroCAD applications can output the patterns and markers in all major industry standards: DXF-AAMA, HPGL-PLT, ISO-CUT and RS274D. A large variety of plotters and cutters are offered with EuroCAD software package, both pen plotters and inkjet plotters. Some of the pen plotters can also be used as cutters, allowing the user to cut stock paper patterns. The markers can be directly sent to an automatic CNC cutter. EuroCAD system is compatible with most of the automatic cutting machines. The program automatically calculates the optimal cut path in order to minimize the cutting time and to increase the cutting accuracy. 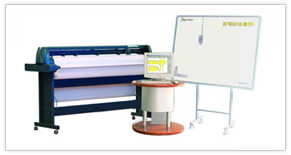 Special functions are available for customizing the cutting procedure, depending on each type of fabric. As the market evolves, so do we. The core values of our company EuroCAD is continuously engaged in the research and development of..
Get more. Do more. Now. The content of our software package From the beginning, our strategy was to create and offer to our clients..